It's been an odd couple of weeks in the world of Stephen Strasburg one of one's. 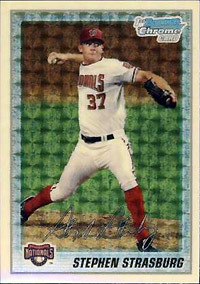 A couple of weeks ago a 2010 Bowman Prospects Stephen Strasburg Red Auto 1/1 hit eBay, quickly surpassing the $16,403 the 2010 Bowman Chrome Prospects Stephen Strasburg Superfractor went for in auction. As a result, the man who purchased the Superfractor several weeks earlier re-listed it on eBay seeing the potential for a substantial return on investment. Several days later, the Red Auto auction began to spiral out of control, at one point nearly surpassing the 1 million dollar threshold, then mysteriously the auction dropped to roughly $500,000 before it came to a mysterious close before it was scheduled to end. It is unknown as to exactly what happened with the Red Auto, it could have been pulled by eBay for reasons unknown, the seller could have ended the auction early due to bogus bids caused by the seller's failure to pre-approve prospective bidders, or perhaps the seller came to an agreement with a buyer in order to avoid the eBay fees. The most likely scenario is that the seller ended the auction early do to bogus bids, but you never know. While the Red Auto remains a mystery at the moment, the fate of the Superfractor is not. The second auction of the most famous and covered card in the hobby came to a close yesterday, ending at $25,000, making the Superfractor investor roughly $8,000 on one card in one month's time. On a side note, there was recently a 2010 Bowman Stephen Strasburg 1/1 Printing Plate listed as a $5,000,000 Buy it Now or Best Offer. The listing was ended without a sale being made, which in all likelihood means it will be heading to auction soon. Hopefully the seller will require that all prospective bidders be pre-approved in order to place a bid. It would be a shame if what started as a great story about the return of sports cards turned into a joke. obviously you don’t know much about eBay. When ebay ends a listing, they delete it completely from their servers. The seller arbitrarily ended it. @Jacob A: I’m not ruling out anything in this case, I reallize that it ended at .99 cents which was the seller, I was simply posing a host of theories. You never know with a card of this magnitude and the odd circumstances surrounding it. Obviously the most likely scenario is that the seller ended it early due to bogus bids which was a result from letting anyone with over 10 feedback bid. Either way, it’s rediculous that people turned the situation into a joke.